What is a beekeeper to do when there are no bees to keep? Read about bees for winter studies, of course! After passing my basic assessment with the British Beekeepers Association (BBKA) earlier this year, I was eager to learn more about bees and beekeeping. The syllabus of the BBKA examinations and practical assessments provide a framework to learn whether taking the exams or not (I’m not). In my first winter studies post, I’m looking at the BBKA module 6 honeybee behaviour syllabus: item 6.1. 6.1 The function and behaviour of the worker honeybee throughout its life including the types of work done, duration of work periods under normal circumstances and the variations in behaviour due to seasonal changes in the state of the colony. A worker bee is ready to hatch. She is one of thousands of honeybees who will hatch that day and emerge to see the hive for the first time. She chews away the wax capping of her cell and struggles to push herself out as her older sisters trample over her head. She is lighter and fuzzier than the adult workers, but her soft hairs will soon get worn off working in the hive. Her first job is to clean the cell she was born in. That done, she is hungry for protein-rich pollen, which she must eat to develop her hypopharyngeal and mandibular glands (to produce brood food and royal jelly) and her wax glands (to build comb). She’ll spend her early days eating lots of pollen, cleaning cells, and sitting on brood to keep it warm. The worker bee spends her first two to three days eating pollen and cleaning cells, and sometimes sitting on brood to keep it warm. By day four she is sent to work in the food-processing factory and builds comb, turns nectar into honey and head butts pollen into cells. Our young worker has become a nurse bee with fully developed hypopharyngeal and mandibular glands. Her brood-rearing duties include feeding brood food to young larvae and honey and pollen to older larvae. If the colony should decide to make a new queen (to supercede the old queen or to swarm) then she will feed royal jelly to the larvae specially chosen to become queens. Her wax glands have started to produce wax, so she moves from the nursery to the food-processing factory. She builds waxy honeycomb, turns nectar into honey and packs pollen into cells, and helps maintain the temperature of the hive by fanning her wings. She will even undertake removing dead bodies, and other waste or debris, from the hive. But it is not all work and no play. The worker often spends a lot of her time resting or walking (patrolling) around the hive. A pool of resting bees is necessary should the circumstances of the colony suddenly change and a number of bees become needed for a particular task. Worker bees often spend a lot of time doing nothing at all! They rest or walk (patrol) around the hive, or just try to out-stare their keepers. While many of her duties depend on glandular development – building wax comb (wax glands) and guard duty (sting gland) – she is a flexible worker and can change jobs when needed. 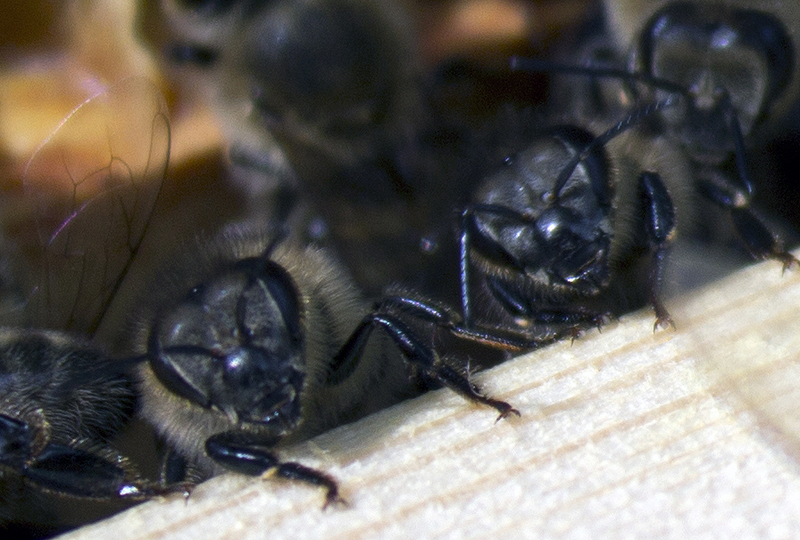 For example, if the colony has recently swarmed she may revert to a nurse bee to help rear new brood. The worker’s life is only loosely structured by the roles accorded by her chronological age, in reality she will work according to the needs of the colony. Her hypopharyngeal gland is now shrinking and starting to produce the enzymes needed for honey production: invertase and glucose oxidase. Soon she will become a forager and her world will become much bigger. As a young house (indoor) bee, she will have taken short flights to orientate herself with the environment outside the hive. Our worker is living on the edges of the brood nest. Her sting gland is fully developed around 21 days old and produces venom as well as sting pheromones (isopentyl acetate) and alarm pheromones (2-heptanone). She is now able to guard the colony. She also fans at the entrance to help ventilate the hive and occasionally stretches her wings on longer orientation flights. Worker bees are sometimes found clustered at the entrance and fanning, like these bees that we found at the entrance of the hive on a cold, rainy day. 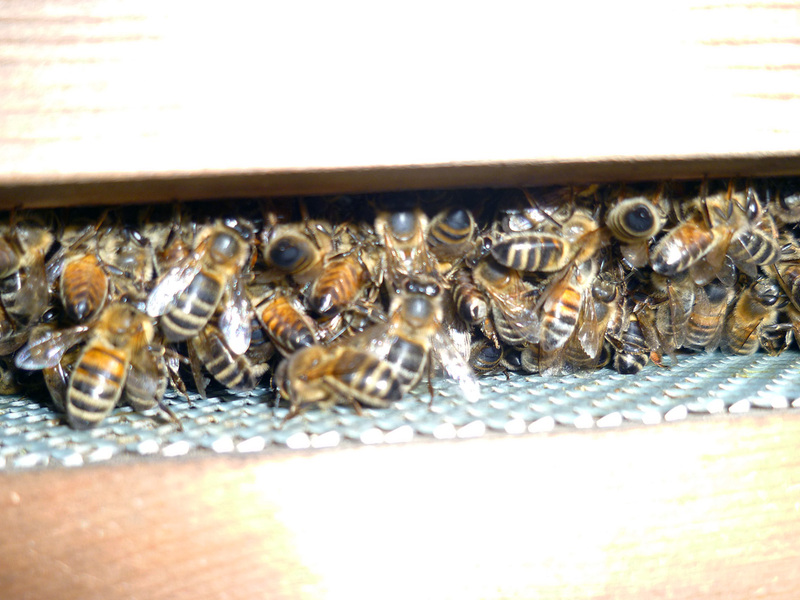 Fanning their wings helps to ventilate and maintain the temperature of the hive. Our worker is now a forager. 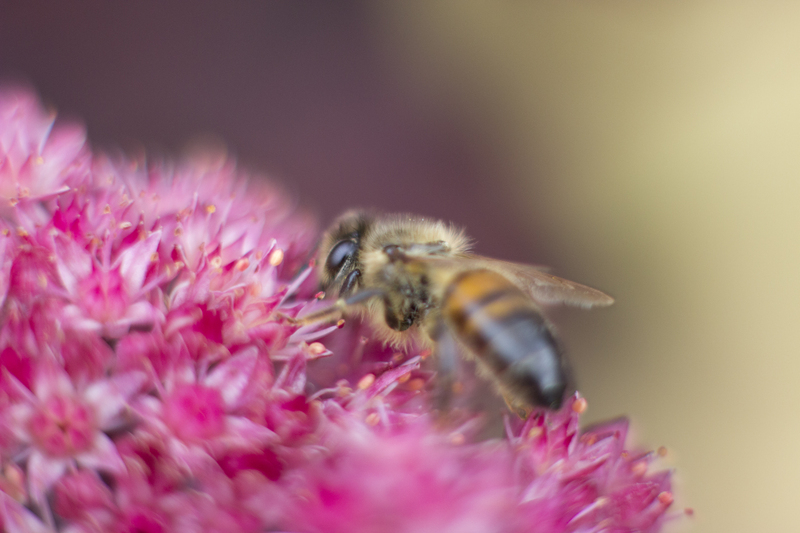 She spends her days flying to trees and flowers collecting nectar, pollen, propolis and water for the hive. When she returns home, she dances for her sisters to tell them the best places to go. In spring and summer workers live between 6–7 weeks: her life is cut short by her foraging activities as she works herself to death collecting food and water for the colony. Her flight muscles are fuelled by the glycogen reserves that she built up as a young worker, but as an adult worker she cannot replenish these stores. Her wings have limited flight miles of around 800km and once she has flown this mileage (whether over 5 or 20 days) she will fall to the ground and die. The worker bee will grow weary on her last foraging flight. Her tired wings will fail her and she will rest and become cold. 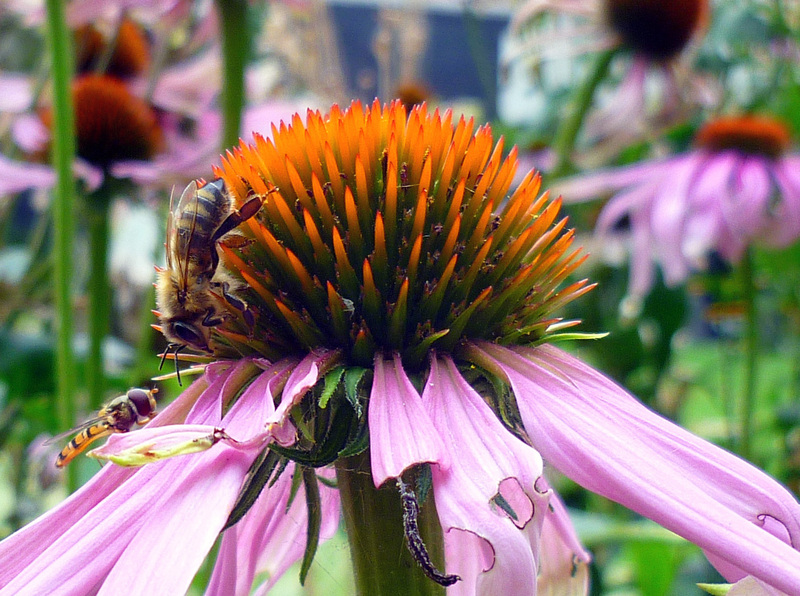 One evening I saw this bee stumbling on the echinacea in the Medicinal Garden of the Royal College of Physicians, and by morning she was frozen on the ground. It happens one day in late summer while foraging in a plentiful bed of echinacea. Her baskets of pollen are too heavy for her worn and tattered wings. She tries to lift herself but she is too tired, so she rests. Night falls as the weary forager sits patiently on the echinacea and away from the warmth of her sisters huddling in the hive. By morning she is cold and slow but the rising sun encourages her to try again. She has precious loads of nectar and pollen to return to the hive and her dances will tell her sisters where to find this abundant crop. She weakly staggers forward and tumbles off the echinacea on to the ground. Our worker dies far away from the hive and, unlike her birth, entirely alone. By clever design of nature, she serves the colony even in death by dying on a foraging flight. Her sisters will not need to expend time and energy dragging her body out of the hive. Inside the hive another worker has chewed away the wax capping of her cell and caught the first glance of her sisters. She pushes herself out and starts to clean her cell. Her life as an autumn and winter bee will be very different to the summer worker. The colony is preparing for winter: the drones are being evicted and the queen is laying fewer eggs. The young worker will produce little or no brood food and the pollen that she eats will make her body stronger and extend her life. She may take a few short orientation flights or the occasional ‘cleansing flight’, but she will not need to forage. 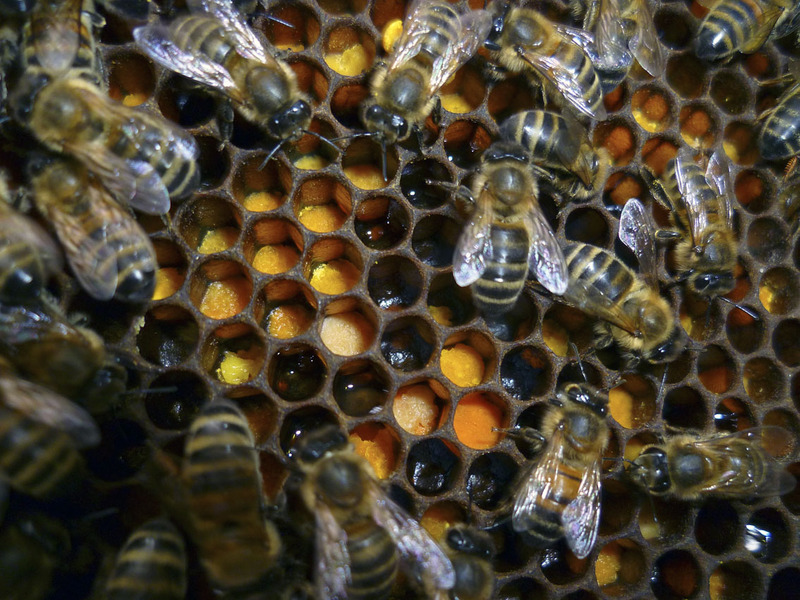 She will live for around four to six months eating the honey and pollen collected by her summer sisters. In winter she will join the workers in a cluster around the queen, shivering her wings to help the colony to stay warm until spring returns. This entry was posted in Beekeeping, Bees and tagged BBKA examinations, BBKA module 6, beekeeping, bees, worker honeybee by Emma Maund. Bookmark the permalink. That’s just reminded me why I love bee keeping, and made me excited in anticipation of the next season…. Thanks, John! Good to see you on WordPress pages too 🙂 Only four and a half months until spring! I feel sad when I see them struggling on the ground too, but I suppose it makes sense: the queen lays around 1,500 eggs a day, so that’s around the same number of bees hatching, living and dying every day. At that rate, in normal circumstances in summer, that would be around 1,500 dead bodies to clear out every day so it’s better for the colony that the foragers die on a flight away from the hive otherwise most of the workforce would be undertakers all the time! it’s so logical, and organised. and that logic has a beauty. but imagining that process from an illogical human position it becomes the scariest thing also. oh, and I had no idea there were beekeeper exams. well done!! Knowing there are around 1500 dead bees every day for every hive it makes me wonder why I don’t see more of them now! So true: I often think about the social structure of the hive and I am amazed at how clever and efficient honeybees are. Then I think about it from the human point of view and it is quite chilling! Evicting drones in autumn when they have outlived their usefulness is one example! The world would probably be full of dead bee bodies except for spiders, wasps, beetles… I saw a lot of dead honeybees and bumbles caught in those giant webs of garden spiders in September. I enjoyed this narrative of the birth, life and death of a worker bee. Thanks, Em. I am looking forward to my holiday and a break from stress! I feel a bit like a weary forager myself! Also, the books that you lent are really helping with revision. But have you noticed how the beekeeping books are just like beekeepers? Each one has a slightly different answer! You deserve a good proper break from everything. I didn’t go to the Scout Hut yesterday as I have a lot on this weekend but will go down to the apiary and check the bees are still there while you’re away. Glad the books are helping. I sent my BBKA correspondence tutor my answers and she disagreed with some of the info I had got from the bee inspectors day at Roots and Shoots this summer, lol! By the way you could still join the correspondence course now that you’re doing the March exam. It’s not too expensive – about £40? and you can just send in answers as you do them, so it’s not like there’s strict deadlines to meet. I’ve just been sending her my revision blog posts with a bit of editing. Hah! Beekeepers always disagree with each other, that’s why bees are cleverer than us! 😉 I thought to do the correspondence course as BBKA feedback on revision would be great. Yesterday’s talk was on winter care for bees. Insulation was a topic: a demonstration on how to use the metal bubble wrap sheet to insulate the roof. It was laid shiny-side down on the fondant and crownboard tucked in at corners. Also said it was a good idea to put in varroa board for one week this month to check the mite drop. I loved the bee story and learned quite a bit. I thought bees were borne to a job and did not realize they preform many different jobs. I of course felt sorry for the weary bee, but have seen this myself in the garden. So sad to see such a hard worker die alone. You will do wonderful on your exams. When you can weave a story like this, learning is so natural. Thanks, Donna. It is sad about the weary bee; nature is ruthlessly efficient and uncompromising, as well as beautiful! Fascinating. I never knew about the time-line in the life and work of the worker bee, it makes more sense to me know.